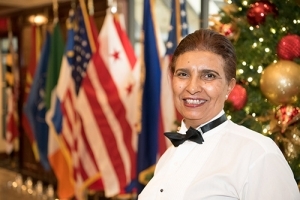 As you travel near and far this holiday season to gather with those you cherish, please don't forget our dedicated National Press Club employees. Every day around the club there's ample reason to thank the staff. Whether it's serving you a plate of delicious food, keeping the restrooms in top order, or making sure that the setup is just right for your booked event, we rely on the 110 staff members who make the club our home away from home. With the season of giving upon us, now is our chance to thank them. I encourage you to show the staff how much we care by donating to the annual employee holiday fund. There are donation boxes at the front desk and on the 14th floor. You can also donate online using the form below. Your donation counts, whatever the size. Your gift will be kept confidential if you choose, public by name if you wish. It's not too late. Whether you donate or not, I ask you all to always take time to thank our Club staff for their hard work. We're all busy, but a nod of appreciation goes a long way. As your president, it has been an honor and privilege to work alongside our team and see the herculean effort that they put in behind the scenes. We are very fortunate to have dedicated staff who care so much about the members' well-being. Please join me in expressing our thanks to the staff, and don't forget to contribute to the annual holiday employee staff fund.